Racism for me is like an open wound. I want it to heal. I want the wound of racism to go away forever. I want it to be a memory, a distant memory, and one that needs a conscious effort to recall. Like the memory of me falling down and slicing my knee open when I was six years old. It is a fuzzy memory, and a scar remains, but it is over. Racism is not over. Every time an African American is killed, every time an African American is shot, oppressed violently, neglected, abused or victimized by systemic racism, my wound becomes fresh. I cry openly, painfully, because it hurts. It hurts on a visceral, inner level that is an almost unspeakable pain. My African blood asks why? Why me? Why my people? After all, we are only human. We only want what’s best for our families, our community, our world. But, the sad answer is that there is no real reason. I could trot out the most discussed, acceptable reasons: white privilege, free slave labor, medical experiments, and superiority complexes. The real reason: money. The real reason: greed. The real reason: inhumane hatred. The real reason: savagery. I realize that we are not the savages. They are. We are not the criminals: they are. We are not the rapists, terrorists, or exploiters. They. Are. I also realize that it is crucial, achingly crucial, that I retain my humanity. If we become the savages that they are, then the world is lost. I know that I must retain my humanity. I must love, live and celebrate my life as it comes each day. After all, in the USA, someone may decide to end my life. Every day is precious for me, and even more precious when I am home. But that is where the danger for me lies. In my place of birth, I am a target. In my place of birth, I am not safe. I cannot freely or safely walk in my neighborhood, go to my church, shop in a store. I have had to live with oppression almost every day of my life. And now, through someone’s savage, barbaric decision, that life could be shortened at any moment. Every day that I wake up, I am grateful. But, I am also fearful. I have Black daughters, a brother, grandsons, nephews, and cousins. Some of them are enjoying being senior citizens, some of them are just beginning their lives. But, I am afraid for all of them. I am afraid that someone, somewhere, may make the decision to take their lives from them. Just because they are Black. And I know that this fear erodes something inside me. I know that this fear affects me, even when I don’t think it’s affecting me. I am paying a price for this fearfulness. 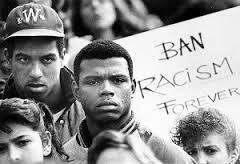 I have been paying a price since I first became aware that being Black in America was to be in a war zone. No matter where in America I might be: Texas, California, New York, Arkansas, coast to coast, north to south, they are all war zones. And yet, as long as I can, I must keep living.